Forest health program staff and coverage areas. The forest health specialist zones were redrawn to better align with the new integrated forester teams, areas and districts. New coverage zones will go into effect on June 25, 2017. Linda Williams has changed coverage zones and is now located in Woodruff. Her new landline is 715-356-5211 ext. 232, but her cell phone number remains the same. Mike Hillstrom has also changed coverage zones and is now located in Fitchburg. His new cell phone number is 608-513-7690. 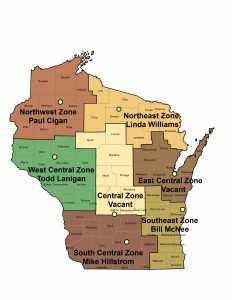 Central Zone: Mike Hillstrom will cover Adams, Green Lake, Juneau, Marathon, Marquette, Portage, Waushara and Wood counties. Linda Williams will cover Lincoln County. Todd Lanigan will cover Taylor County. East Central Zone: Linda Williams will cover Brown, Menominee, Oconto, Outagamie, Shawano and Waupaca counties. Bill McNee will cover Calumet, Door, Kewaunee and Manitowoc counties. Written by: Rebecca Gray, forest health team leader, Fitchburg (rebecca.gray@wisconsin.gov), 608-275-3273.